Electrostatic discharge (ESD) is one of the most prevalent threats to electronic components. In an ESD event, a finite amount of charge is transferred from one object (i.e., human body) to another (i.e., microchip). This process can result in a very high current passing through the microchip within a very short period of time. Thus, more than 35 percent of single-event chip damages can be attributed to ESD events, and designing ESD structures to protect integrated circuits against the ESD stresses is a high priority in the semiconductor industry. Electrostatic Discharge Protection: Advances and Applications delivers timely coverage of component- and system-level ESD protection for semiconductor devices and integrated circuits. Bringing together contributions from internationally respected researchers and engineers with expertise in ESD design, optimization, modeling, simulation, and characterization, this book bridges the gap between theory and practice to offer valuable insight into the state of the art of ESD protection. Electrostatic Discharge Protection: Advances and Applications provides a single source for cutting-edge information vital to the research and development of effective, robust ESD protection solutions for semiconductor devices and integrated circuits. Juin J. Liou received his BS (honors), MS, and Ph.D in electrical engineering from the University of Florida, Gainesville, in 1982, 1983, and 1987, respectively. In 1987, he joined the University of Central Florida (UCF), Orlando, where he is now Pegasus distinguished professor, Lockheed Martin St. Laurent professor, and UCF-Analog Devices fellow. Highly decorated and widely published, Dr. Liou holds eight US patents (with five more pending) and several honorary professorships. He is a fellow of IEEE, IET, and Singapore Institute of Manufacturing Technology, and a distinguished lecturer in the IEEE Electron Device Society and National Science Council. "… very timely, as the contributors are the experts within their respective fields and industries. … covers important applications of electrostatic discharge (ESD) protection circuits like automotive integrated circuits, GaN-based electronics, and advanced foundry processes. I strongly recommend this book to circuit designers and failure and analysis engineers." "An excellent team of experienced authors who have written and presented extensively on ESD protection of silicon chips, including tutorials and short courses at various conferences, are sure to come up with an outstanding book, both to serve as an introduction to those new in the field and to provide timely updates to those already working in it." "... enters into details about component-level protection, and this is a merit of the book because several books investigate solutions at the system level, but very few do so at the component level. ... a valuable resource to industrial designers of components based on complementary metal-oxide semiconductor (CMOS) technology and electronic equipment, as well as to development engineers. It will be of interest to managers and designers of consumer electronics and to researchers in electronics." 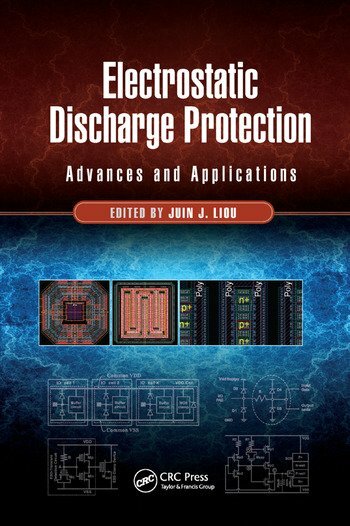 "Edited by Dr. Juin J. Liou in collaboration with Krzysztof Iniewski and 20 other editors, Electrostatic Discharge Protection: Advances and Applications brings together a team of experienced and well-respected researchers and engineers from around the world, representing universities and semiconductor industries, with expertise in electrostatic discharge (ESD). This book truly represents the hall of fame of ESD. This book is an A-to-Z complete guide for the ASIC ESD designer; it includes charts, tables, test procedures, and standards, making it a must-have for every ESD designer."